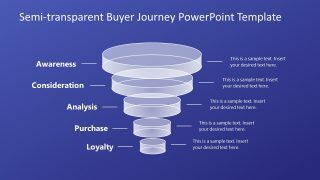 The 5 Level Semi Transparent Funnel Diagram for PowerPoint is a sales and marketing model presentation. 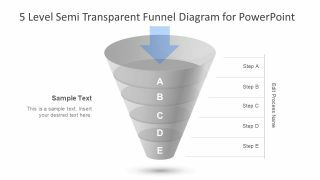 The funnel charts are an integral part of business marketing strategies. 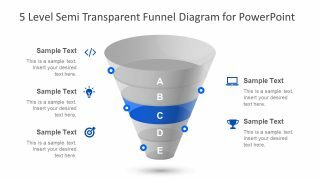 The funnel chart PowerPoint can assist the companies to streamline the requirements and objectives. 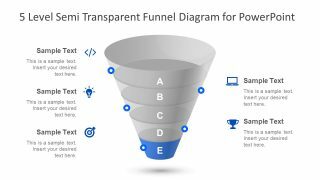 For example, a company can use the semi transparent marketing funnel template to narrow down their sales objectives. Or, reduce to their desired target audience through 5 level filtering process. 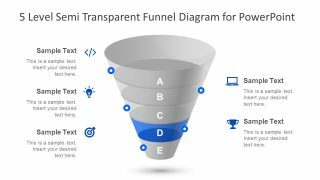 The 5 level PowerPoint diagram of funnel makes the presentation more intuitive with a beautiful semi-transparent layout and 3D effects. 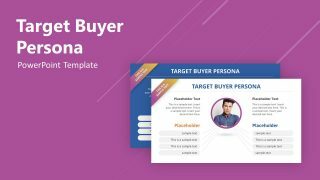 It is an impressive template design for range of sales and marketing presentations. 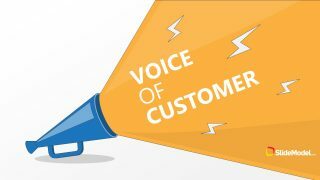 With few changes in the editable graphics and theme, the slides can easily blend into any business presentation. 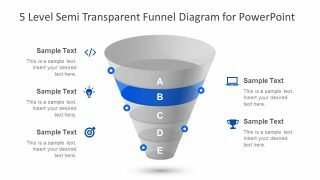 The sales and marketing presentation of 5 Level Semi Transparent Funnel Diagram is a process flow template. 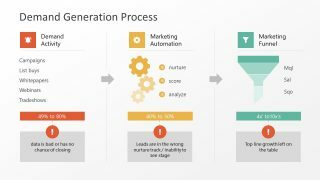 As a marketing funnel, it can display the selection criteria while outlining the target outcome. Just like the recruiting process, which considers all the candidates who apply for the job. Later, apply filters based on qualifications, experience and move towards more specific indicators. This way, the recruiter can narrow down the search to few, most suitable candidates, and save time on further processes. 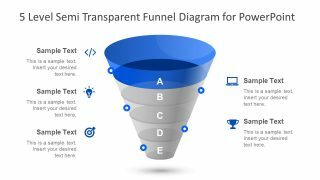 Because the 5 level semi transparent funnel chart contains clipart icons to represent each phase. 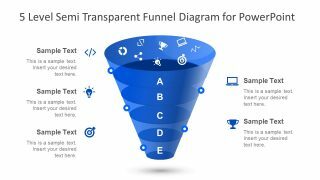 The users can create a funnel diagram for just about any topic and use graphics to represent the meaning. The funnel diagram of 5 level semi transparent design provides three variations in the layout. The first five slides highlight every level of diagram per template. But in the last two designs, one is a gray funnel with an arrow directing downwards. And, the second design shows a set of icons depicting the data going through the funnel process.